By sprinkling trees amid farmland, land managers can improve regional biodiversity and foster a healthier ecosystem. But wild animals in these hybrid environments still may not thrive like they do in forests, a new study suggests. For the study, University of Florida researchers examined bird behavior on livestock farms with significant tree cover, known as silvopastures. In forests, insect-eating birds of different species move together through the trees, helping each other forage for prey and protect themselves from predators. But in silvopastures, mixed-species flocks formed less frequently and therefore foraged less successfully, said Bryan Tarbox, an agriculture researcher who co-authored the study. The team conducted the research in Alcalá, Colombia, in the foothills of the Andes. Researchers observed five insect-eating bird species across 12 sites for more than two years. They found that when birds do band together in silvopastures, they don’t reap the usual benefits — it didn’t make any difference on a forested farm whether the birds flew alone or flocked in groups. “The attack rates, and all those metrics of foraging success, are the same,” Tarbox said. Since fewer bird species occupy silvopastures, the benefits of group foraging aren’t as strong. 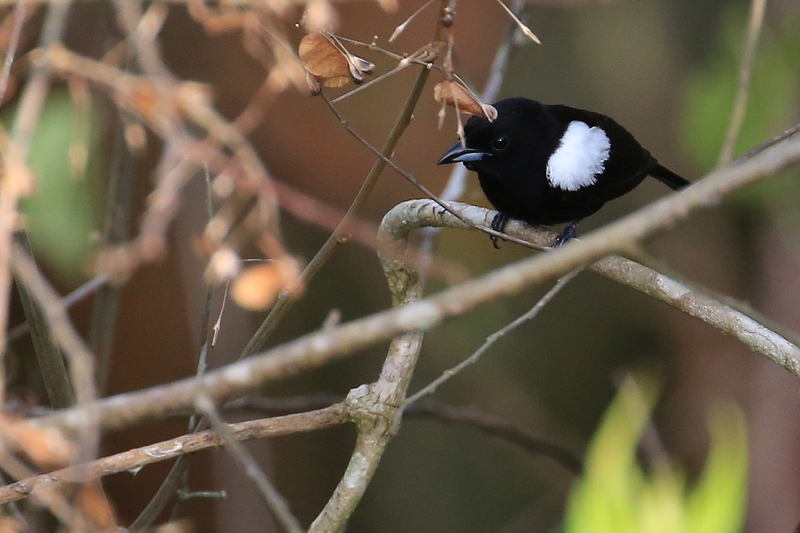 For example, white-shouldered tanagers — all-black birds with distinct white patches above their wings — are common in forests, yet Tarbox almost never saw them in silvopastures. Two other birds species were also far less common in silvopastures, he said. Tarbox said his research demonstrates the interdependence of species: how removing or reducing some birds from the flock affects other birds’ success. Like any conservation effort, Tarbox said, it’s important to keep the region’s specific attributes in mind and not to overgeneralize findings. “One thing may work really well in one place and not well in another,” Tarbox said. The outcome might be more pronounced closer to the equator, a region that has more bird species than, say, the Midwest, said Michael Ward, an avian ecologist at the Illinois Natural History Survey, who was not involved in the research. As a result, birds in the tropics are used to interacting with other species and are more sensitive to changes. “In the tropics a lot of the forest birds like a very specific niche, a specific habitat,” Ward said. The new study, which was published Sept. 19 in the journal The Condor: Ornithological Applications, is a step toward understanding how conservation efforts interplay with inevitable environmental destruction, Ward said. Nina Pullano is a SHERP student and writer for Scienceline. Her writing has also been published in Spectrum, an autism research magazine.